Editor’s Note: MMW’s Shireen previously wrote a piece on Nike’s Pro Hijab, which can be found here. Nike’s Pro Hijab – via Nike. In the Spring, Nike announced the upcoming release of its Pro Hijab. Yet, I’m suspicious of the company’s intentions. Earlier this week, MMW Shireen wrote a piece describing how Nike’s narrative around its first sports hijab erases the long history of Muslimahs fighting for access to sports, as well as Muslim women’s companies that have sold sports hijabs since decades ago. 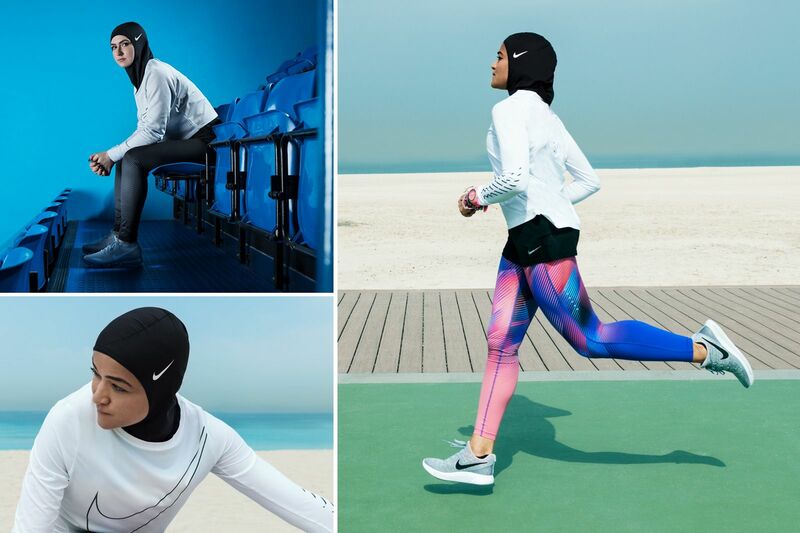 While Nike is claiming it created its’ hijab to help Muslim women, the new product seems like a publicity stunt. I’d like to applaud Nike for some of the things they have done right. Unlike Vogue Arabia, which despite criticism chose to feature a non-Muslim wearing a hijab for the sake of “art,” Nike has chosen to feature prominent hijabi Muslimah athletes as their models. The company also seems to have worked with Muslimah athletes while they designing and testing the new garment. That’s where my praise ends. There has been so much fanfare surrounding Nike’s growing modest wear collection that I can’t help but feel the company is creating the clothing more for the sake of their own notoriety than for the Muslim women who will wear the clothes. A couple of weeks ago, I argued that the media consumes the bodies of racialized people for economic gain; fashion outlets are no different. The “fashionable Muslim” trend has been going on for a while. In 2012, Eren wrote a piece about a Russian Islamic style festival that was intended to “prove” that Muslims can be fashionable. In 2015, Shereen wrote about H & M’s first hijabi model and how little it did to convince Western societies that Muslims can be part of the mainstream. In 2016, Tasnim, Shereen and Afia round-tabled on Dolce & Gabbana’s abaya collection, which made waves in the US and western Europe and ignored the already successful fashion industry in the Middle East and Southeast Asia. I find it incredibly wearying that we are constantly asked to prove our humanity. Each of these instances showcase a scenario in which the attention was not on the models themselves, but on what they can do for the companies. Both Nike and Mattel, for instance, know Ibtihaj Muhammad has a positive image among not only among Muslim women, but racialized women, as well. Muhammad has long championed the representation of racialized women in the media and in athletics, but it seems the companies have used her as a marketing ploy to get Americans onboard with their decision to create Muslim-related products and to boost their sales overall. Why not hop on the bandwagon, especially when there’s money to be earned, right? Muslim-American households are slightly better off economically than some other American households, in general. According to the Pew Research Centre, about 49% of Muslim-American households make more than $50,000 per year, while nationally about 45% of households make that much. Of the 49%, 20% make above $100,000 per year. Time Magazine listed Nike’s hijab as one of the top inventions of 2017, but Nike is not the first company to create modest sportswear and athletic hijabs. Ruqsana Begum co-founded Capsters in 2008, and Ahmed Ghanem created Cool Dry in 2015. Although not a pull-on hijab like the others, Cool Dry serves many of the same functions as a sports hijab, such as temperature control, sweat absorption and water resistance. Fatimah Hussein founded ASIYA in 2015, after realizing the girls she coached lacked uniform sportswear. The company still supports young Muslimah athletes. Modli features some Judaism-specific items on its site, but for the most part sells general modest fashion, including modest active wear. When the media and fashion industries get together, it’s not necessarily about who does something first. It’s about who can create the most buzz. As of right now, the main options for athletic hijabs and modest sportswear are quite expensive. Capster’s and Cool Dry hijabs are between 18 and 36 USD. Shukr sells sports pants for about 55 USD, while Nike’s basketball skirt is a whopping 150 USD. Nike’s hijab is expected to cost 35 USD, which puts it at the higher end of the price spectrum of similar products. On its site Nike states that, “By providing Muslim athletes with the most ground-breaking products, like the Nike Pro Hijab, Nike aims to serve today’s pioneers as well as inspire even more women and girls in [the Middle East] who still face barriers and limited access to sport: Fewer than one in seven girls participate in locally recommended sport activities for 60 minutes or more.” How exactly does Nike plan to be exclusive when their product is essentially only available to the wealthy? If Nike really planned on encouraging girls to participate in sports, why didn’t it create a more affordable product? I try to workout 3 to 5 times per week, and I engage in a mix of high and low intensity activities. I love the idea of modest sportswear, but I simply can’t afford it. I work out in a 5 USD scarf I got from Target, a long sleeved shirt pulled from the women’s section of the same store and 10 USD harem pants I bought on Amazon. Occasionally, I need to layer a long-sleeved crop top under a short sleeved running tee shirt. It’s not ideal, but the limited choices of sportswear styles and the high price of modest sportswear means I have to either make it work or stop exercising altogether. The latter is not really an option for me. The women who participate in team sports or are otherwise tied to professional organizations don’t have much of a choice. They must wear attire deemed “safe” by their coaches and organizations, and the “safe” attire tends to be expensive. While the addition of the Nike hijab isn’t necessarily hurting matters for economically disadvantaged Muslimah athletes, it certainly isn’t helping. Since all of Nike’s clothing is expensive, I never really expected their hijab to be reasonably priced, though. I do, however, wish Nike and the media would stop fawning over the scarf as if it’s God’s gift to a Muslim woman. The more Nike pushes it’s “cool,” “new,” “exotic” product, the more they actually “other” Muslim women athletes. While our religion and cultures are important when it comes to representation, at the end of the day we want acknowledgement for what we do, not for what we wear. Not all Muslimah athletes wear hijab, that doesn’t make them any less Muslim or any less athletic. The sooner this hijab hype blows over, the better.